Make the most of the time you don't have. The outgoing Passat models are still available from stock at your local Volkswagen Retailer. Download a pricelist for details. Combining intuitive technology, a spacious interior and dynamic styling with familiar convenience, reliability and comfort. Everything about the new Passat is designed to make your busy life easier. The new Passat's elegant design radiates confidence. 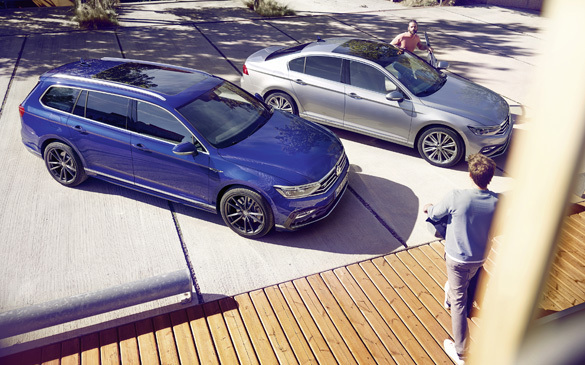 The new Passat's fresh contours create an expressive and self-assured look. The interior has been restyled with signature ambient lighting and a heightened sense of space. The new Passat's comfortable, high quality interior creates a pleasant feeling of space, and can be easily adapted to transport larger items. 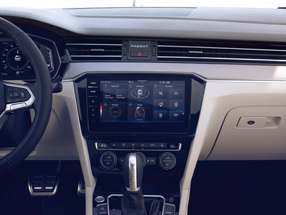 The new Passat's signature interior ambient lighting can be adjusted to suit your personal preference. 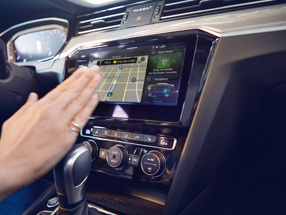 The new Passat's intelligent technology makes your driving experience easier, safer and more comfortable. The Travel Assist System automatically adapts to your style, partially automating your driving experience for your comfort and convenience. Parking sensors and the optional Park Assist System help you park and manoeuvre while keeping control of your car at all times. The Front Assist with Pedestrian Monitoring System will alert you to pedestrians in the road and brake automatically if you do not react, within the limits of the system. The Proactive Occupant Protection System automatically takes measures to protect you and your passengers when it detects a critical situation, such as an imminent collision. The new Passat is full of innovations designed to make your busy day easier. The new high-resolution Active Info Display provides all the key information you need while you're driving, with optional instrument styles. Simply wave your foot under the rear of your new Passat and the Easy Open option will open the luggage compartment for you. Enjoy outstanding sound, intuitive navigation and the convenience of the new Passat's voice control system. 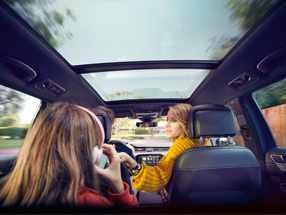 Access your favourite services while driving in your new Passat: Apple Music, Spotify and Amazon music are all supported. The optional voice control system lets you choose your favourite music and plan your route while keeping your eyes on the road. Get all of your in-car entertainment in one place with Composition Radio. The optional Discover Pro integrates the navigation system with Infotainment functions. With gesture control. Expand the connectivity of your cockpit. 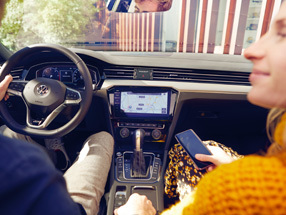 Our all-new wireless Car-Net App Connect transfers your smartphone apps onto the touchscreen of your Infotainment system while charging your phone*. Supports Apple CarPlayTM, Android AutoTM by Google and MirrorLink®. * With compatible models only. Modern mobility with hybrid technology. With a powerful engine, great fuel economy and exceptional range, the new Passat GTE with plug-in hybrid technology puts you on the road to tomorrow. 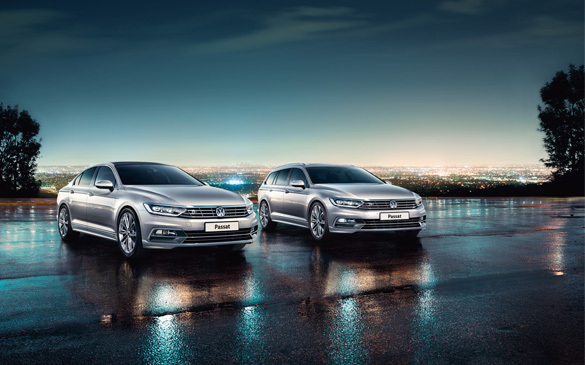 The Passat GTE has an expressive and self-assured look, with elegant light signatures inside and out. The new Passat GTE's blue-contrast seat covers add a sporty and confident touch. The standard LED headlights with reflector technology offer a long service life and great efficiency. In purely electric mode, your Passat GTE can travel up to 34 miles (according to Worldwide Harmonised Light-Duty Test Procedure) on one battery charge. The perfect companion for your on-road and off-road adventures. The new Passat Alltrack shines with confidence on and off the road, with rugged underbody protection and heavy duty running gear. The Passat Alltrack is built with high-quality design elements made of stainless steel, chrome and aluminium. The Passat Alltrack is ideally equipped when the going gets tough with increased ground clearance, off-road driving program, heavy-duty running gear and underbody protection. Standard 4MOTION all-wheel drive improves safety in wet and slippery conditions, and gives you added confidence on even the most challenging surfaces. The Passat Alltrack's intelligent technology gives you a highly dynamic driving experience with outstanding traction on practically any surface.